If you're installing a new stove or furnace, check the label for the amount of current it draws. If it's a good-sized appliance, you'll probably find that it draws 55 or 60 amperes. That means you need to install a 60-amp breaker in the panel to control it. Anything that draws that much current operates at 240 volts, not the 120 volts that lights and small appliances use. To get that voltage, you need a double-pole breaker, which consists of two normal single-pole breakers stacked together. Unlike a single pole breaker – or a tandem breaker, which consists of a pair of single pole breakers in a super slim casing – a double-pole breaker contacts both bus bars on the panel. When you attach a hot wire to each breaker in the two-breaker set, the voltage between these wires is 240 volts. Connect a return wire from the circuit cable to the neutral bus and the ground wire to the ground bus to complete the breaker installation. What Is the Correct 60-Amp Breaker Wire Size? Wire gauge is important. If you use wire that's too small, resistance will cause the wire to overheat when the maximum current for which the breaker is rated passes through it. That can start a fire, and you don't want that. On the other hand, heavy-gauge wire is difficult to handle, difficult to connect and expensive, so you don't want to oversize the wire. Electrical wire manufacturers publish charts recommending the maximum current for each wire gauge. According to most of these charts, 6-gauge wire is suitable for 55 amps, which means that, technically, you should jump to the next gauge for a 60-amp circuit. That would be 4-gauge wire. 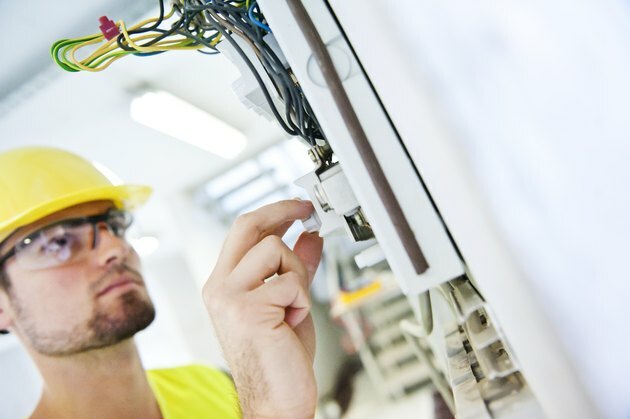 In practice, however, it's common to wire 60-amp breakers with 6-gauge, 3-conductor wire because an appliance that needs a 60-amp breaker seldom draws the full 60 amps. If you're installing a 60-amp subpanel, however, it's best to connect it to the main panel with 4-gauge wire. A 60-amp panel controlling several circuits could easily draw a maximum of 60 amps before the subpanel breaker trips. Before you do any work in the panel, it's important to remember that the bus bars are always energized, even when the main breaker is off. That means any false move with a tool or your fingers could be disastrous. If you aren't confident working in the panel, don't do it. Get an electrician and save yourself from the chance of getting a serious shock. If you choose to go ahead, wear rubber-soled shoes and rubber gloves, and use insulated tools for safety. Connect the white wire to the neutral bus, which is the chrome one with white wires attached to it. Connect the ground wire to the ground bus, which similarly has more ground wires attached to it. Connect the red wire to one of the lugs on the 60-amp breaker – it doesn't matter which one – and connect the black wire to the other lug. When everything is tight, position the breaker in front of a vacant slot (you actually need two adjacent slots) and snap it into place.